Our philosophy is to give the dogs at Glen Highland Farm the time they need to recalibrate their behaviors and learn new associations with people. The cost of ongoing care is high. Just like any family dog, needs arise and we must handle them, whether it's antibiotics, blood chemistry analysis, or shots, these dogs require more from us. Our adoption fee of $325 in no way covers what we tackle when taking each dog into rescue (vet visits, diagnostics, medications, surgeries, etc) Your ability to donate when you can, whatever you can, all adds up to help. So, every time you are an Angel for a dog, that means we know their immediate care is covered. of abandoned & unwanted border collies & border collie mixes & to fostering the human/animal bond through new levels of awareness and connections to the heart. ** PLEASE NOTE: Donations for any specific dog is appreciated!! 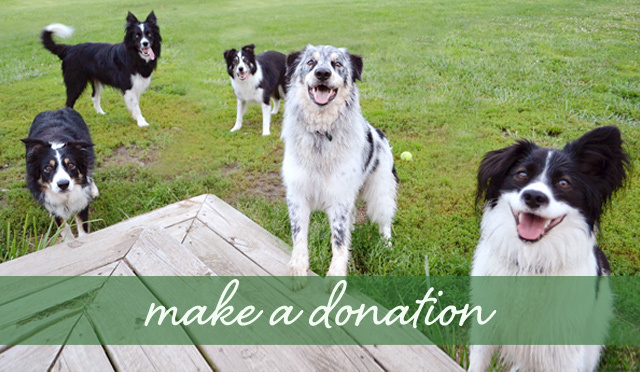 A BORDER COLLIE ANGEL is a $350 donation - you will receive an ANGEL CARD featuring the dog you are supporting! with the costly care we provide for ALL the dogs! who kindly help ALL the dogs at GHF on an ongoing basis. We are deeply grateful to you all.